Effi Briest, the 19th century novel by Theodor Fontane, was given to me at the tender age of 14 and has left a deep mark upon my soul. Rainer Werner Fassbinder’s 1974 cinematic adaptation is itself also a masterpiece, a jewel of a film that is superbly directed, photographed and acted. Effie Briest, Flaubert’s Emma Bovary, Ibsen’s Nora, all 19th century women of revolt, can be traced back to classical Greek figures like Antigone and Lysistrata, but their plight is still a very modern dilemma in our present society of fanatic, religious zealots. For example, young Emma’s free spirit batters against the Prussian law and order of her older spouse; her quest for warmth dashed by his coldness. Luminous Hanna Schygulla, one of the best actors to come out of post-war Germany, gives a stellar performance as Effi. As in Fassbinder’s The Marriage of Maria Braun (1979), she is pure light and transparency, conveying a lightness of being while trying to overcome the obstacles that her dull, over-ambitious husband imposes on their life. Although living during the time of Bismarck, Effi already evokes the “make love, not war” heroines of the 1960s, reminding us that humanity is born for love and warmth. But although “love is colder than death”, as the title of Robert Katz’s biography of Fassbinder suggests, Effi ultimately dies without ever losing her humanity, forgiving the husband who has not been able to understand the true meaning of love and life. Fassbinder’s film re-creates a finely detailed sense of the Bismarck era, and is shot in a classic style with surprisingly little sense of irony. Jonathan Rosenbaum anointed Fassbinder as the 1970s cinema’s sadistic postmodernist disciple of Sirk, “getting mileage out of photogenic suffering”. But such a description does not accurately characterise Effi Briest. Effi, despite her acts of adultery, is depicted as an angel, wandering through the film with invisible wings, accepting grace. It is her notably over-ambitious mother who pushes her, at a tender age, into the arms of a passionless Prussian nobleman, twice her age. Transferring her own desires onto her daughter, the mother rejects Effi as a failure after she is repudiated by her new husband. Effi remains one the screen’s strongest heroines – though her strength is founded upon an acceptance of her fate and of the people who have rejected her. When her parents discard her after her husband’s rejection – and even her young daughter sides with her father against her mother – we feel that Effi continues loving them regardless. She continues to remain calm in her small Berlin apartment; the only person following her there her Catholic nanny, herself a victim of family and society, beaten by a cruel father after giving birth out of wedlock. Fassbinder is one of the cinema’s great women’s directors along with George Cukor, Douglas Sirk (Fassbinder’s idol), Luis Buñuel, Jacques Demy, Ingmar Bergman, Claude Chabrol, Robert Altman, Pedro Almodóvar, and the still to be rediscovered, Vincent Sherman. 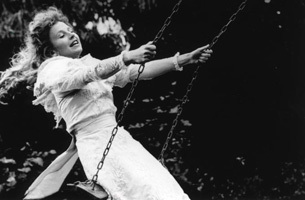 Unfortunately, though, our civilisation remains like the swing Effi sits on, swinging into the light … only to fall back again and again. Both Fontane and Fassbinder condemn Christianity – Catholic and Protestant – for its failure to understand the female condition and its needs. But there is ultimately nothing completely dark or decadent in this adulterous novel and movie, while its ending – showing a dying Effi – is neither hypocritical or Hollywoodish in character. Ultimately, the conformist people who survive Effi are the real victims: the ambitious parents who are responsible for sacrificing their only daughter to an arranged marriage; the Prussian husband who is blindly bound by his stupid codes of honour and ambition; the small daughter who does not have the courage to side with her mother. But in death, Effi has power over their souls. “Beyond the grave” their memory of Effi will be hellish and regretful. They will be cheated forever of the light that Effi tried to shine upon their “miserable” lives. In her own gentle way, Effi does not ultimately allow others to exploit her emotionally (highlighting a theme of “emotional exploitation” that obsessed Fassbinder until his death). Thomas Elsaesser has described Fassbinder’s oeuvre as “A Cinema of Vicious Circles” (1). Effi Briest is a heroine of the Enlightenment or the Age of Reason, reminding us of the “vicious circles” we are yet to break free from – the murderous timeless dance of the oppressor and the oppressed. The film ultimately unravels with Effi on her deathbed. She has not changed or solved anything, but she has had the courage to attack her husband’s claustrophobic world. It is crystal-clear that Fassbinder and Fontane project their feminine side onto the character of Effi (in a manner reminiscent of Flaubert’s admission, “Madame Bovary, c’est moi”). These adulteresses bite the hand that feeds them – while Fassbinder showed similar tendencies in his various attacks on the materialism of post-war West Germany. Despite the apparent material abundance of the world, Effi Briest reminds us not to neglect our spirituality or authenticity, to remain truthful to our “inner light” even if this lucidity causes us pain or… death. Fassbinder meets Fontane in Effi Briest. Despite the “aesthetic duplicity” (2) of the film, and Fassbinder’s work more generally, it still has it roots in the unresolved dilemma of the human condition. Effi Briest uses the conventions of melodrama (the triangular desire of the husband-wife-lover, in particular), but emerges as a timeless masterpiece through Fassbinder’s artistry and the superb performances of his cast (Hanna Schygulla, Wolfgang Schenck, Ulli Lommel). It rises above kitsch and remains one of the best films to emerge out of post-war Germany. Effi’s plight, like that of her Gallic counterpart Emma Bovary, may also be that of Fassbinder – “Effi, c’est moi”. Thomas Elsaesser, “A Cinema of Vicious Circles”, Fassbinder, ed. Tony Rayns, British Film Institute, London, 1976, pp. 24-36. Frank Episale, “Genet Meets Fassbinder: Sexual Disorientation(s) in Querelle”, Bright Lights Film Journal no. 53, August 2006.